Here is a simple question… Look at the below image. 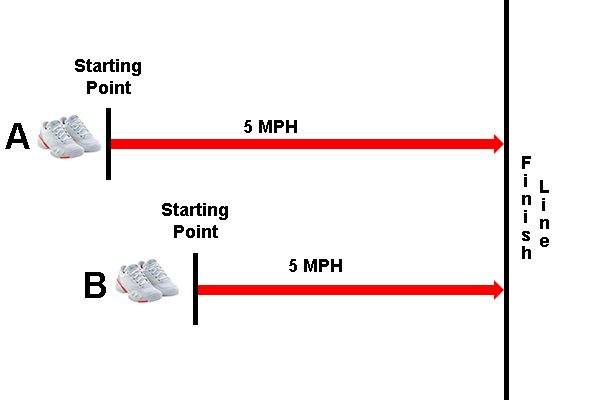 If A and B both run at the exact same speed, who will get to the finish line first? Obviously B will win every time. Now for a potentially tougher question. Which of the three images below is the correct position to be in based off where the ball is? The correct answer is Example A. Many people would pick Example B. 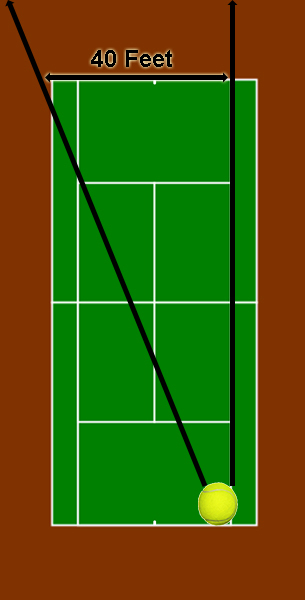 Most players will stand by the hash mark after every single shot regardless of where they have hit the ball. My assumption is they do this because they think they should stand in the middle of the court to give themselves the best chance to retrieve the next ball no matter where their opponent hits it. This assumption would be correct if they would never have to run past the singles sidelines to hit the ball. This would even be the correct place to stand if the ball from this position could be hit equally to the left or to the right. The problem with doing this is that the court is not the boundary upon which a ball can be hit. 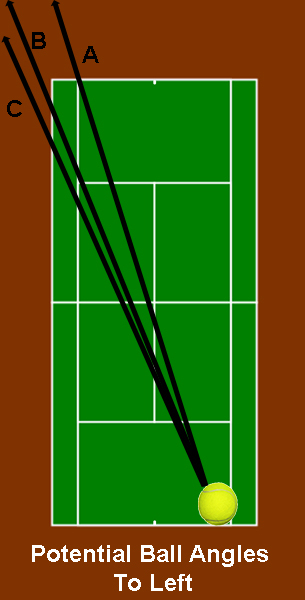 Balls are sometimes hit in the court but are returned from outside the boundaries of the court. Because of this, it is usually wrong to just go stand at or near the center hash mark after every hit. 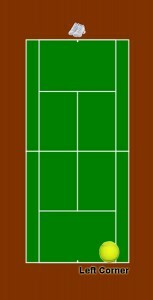 By standing at the center mark the player may be standing in the middle of the actual physical court, but they are not standing in the middle of the potential area their opponent can hit the ball in. They are like runner A in the first example no matter where the ball is when their opponent hits it. Bisecting the potential angle, sounds kind of scary to me… seems like a very big term, but bisecting the potential angle basically means standing in the middle of the range of where the ball can be hit. Many people make the assumption that standing at the center mark accomplishes this. The problem with this is that it rarely puts the player in the middle of the balls range. Lets go back to the ball example. 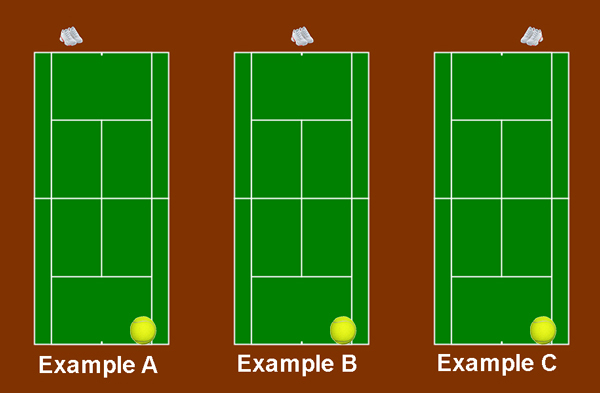 What is the potential range the opponent can hit the ball to from its current position? Lets take this one potential shot at a time. If the opponent hits the ball to the right they can basically just hit the ball down the line. It would be virtually impossible for them to hit the ball to the right of the line unless they put some super crazy spin on the ball. But we are going to assume they can’t or won’t do that! Hitting the ball to the left is a bit of a different story. 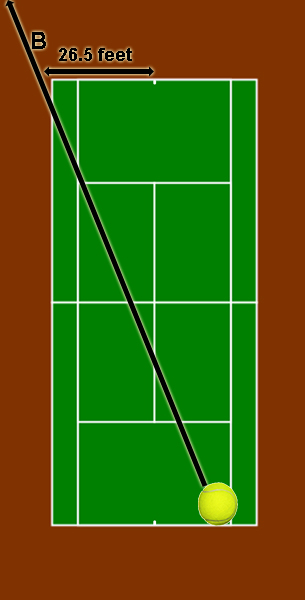 The left singles line is not a boundary when hitting the ball to the left. 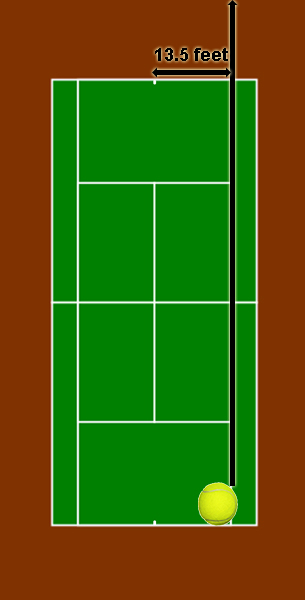 The player will have several potential angles they can hit the ball to the left. Granted angle C is a bit extreme but it is still a plausible angle. We will use Angle B for the potential range to the left. We now know the potential overall range of the ball since we know where to the left and right the ball can be hit. The potential overall range from this position is about 40 feet if standing at the baseline. and potentially a lot more if we are standing behind the baseline. On a side note… Because the range is so much greater the farther behind the baseline one stands its a great idea to stand as close to the baseline as possible. 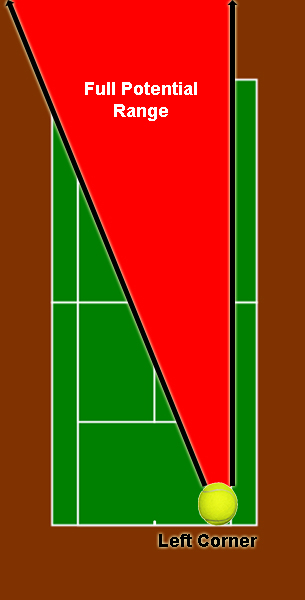 For arguments sake lets assume the player has decided to stand at the center mark after hitting the ball to the left corner of their opponents court. From the center mark to the singles sideline it’s 13.5 feet. 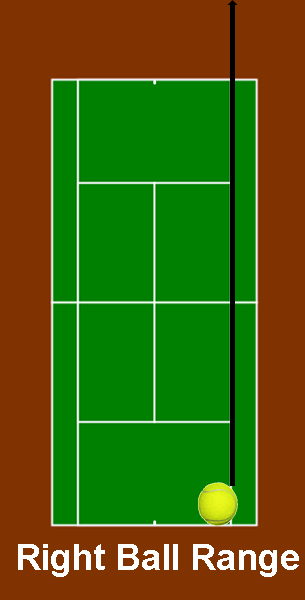 Since the range for a ball hit down the singles sideline is the singles sideline we can assume the player will need to run 13.5 feet to retrieve a ball hit down the singles sideline. Subtracting 13.5 from 40 leaves 26.5 feet for the player to run to hit a ball that is hit on angle B . Which ball will be easier for the player to get to? Obviously a ball hit down the line since they will only need t0 run 13.5 feet vs 26.5 feet. This player better hope their opponent hits the ball down the line! In order to give themselves the greatest chance to retrieve any ball hit, the player should stand in the middle of the forty foot range. They need to stand 20 feet from the singles sideline, not 13.5 feet. 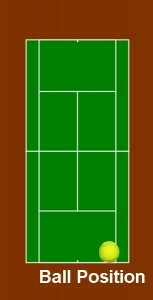 By standing to the right of the center mark the player is giving themselves the greatest opportunity to return the ball no matter where their opponent hits it. They are standing in the middle of the balls potential range or bisecting the balls potential angle. The full range the player could hit the ball is shown in the below picture. By standing in the middle of this range it won’t matter where the opponent hits the ball. The player will always have the best overall chance of getting to the ball. Standing in the wrong place (in this example the center mark) would give the player a better chance of returning a ball hit down the line and a much lower chance of returning a ball hit cross court. The depth at which the player hits the ball is also a consideration in where the player should position themselves after the hit. The deeper a player hits the ball the shorter the potential range. This is a simple geometric fact. Notice in the above photo how the overall range a player can hit the ball is basically in the shape of a triangle. No matter where on or off the court the player is hitting the ball from, the overall potential range will be in the shape of a triangle. Potential ranges are all triangles. The interior angle of a triangle, regardless of shape needs to add up to 180. If any two sides of a triangle are elongated the angle corresponding to those two sides will decrease while the other two angles will increase. In the case of a right triangle one will increase and the other will stay at 90 degrees. This is easy to visualize by looking at the below image. The angle for point C in the closer tree is greater than the angle at point C’. 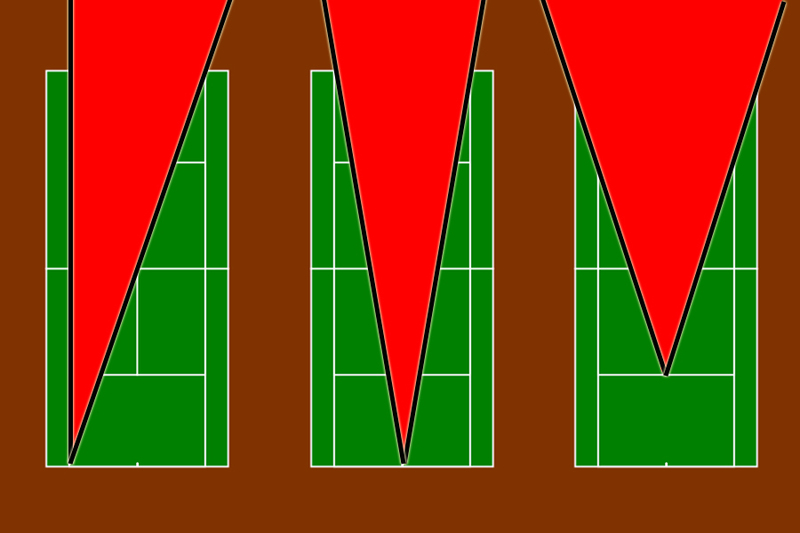 If we were to take line AB and move it closer to the trees we can see that for C’ the AB line would need to be longer to connect the lines than for C.
No matter where some one is standing on the court they must always stand in the mid-range of where their opponent can potentially hit the ball. By doing this a player will more likely be able to get to the ball and hit it. 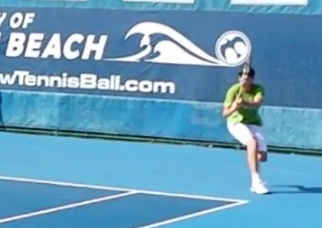 This course will focus on the best positioning from every scenario one can get into on the tennis court.